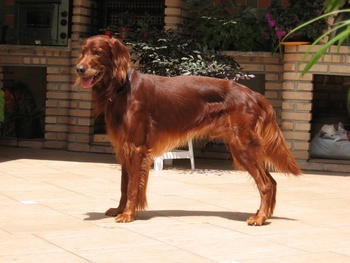 Beautiful and graceful, Irish setters have a silky, feathered coat that is deep chestnut or red in color. Their regal looks have made them popular in the hunting field, show ring and homes of people since the early 1700s. Developed, according to the AKC, by crossing Irish water spaniel, Irish terrier, English setter, spaniel, pointer, and Gordon setter, and then selectively bred for their hallmark coloring, Irish setters were used for hunting of game birds. Their popularity in the field boomed in the 19th Century, which made them popular in the conformation ring, too. By 1948, the breed had come to dominate the conformation ring, but had slipped in status in the field. The dramatic split led to not only two lines of Irish setters, but to the creation of the red setter, which was the result of outcrossing some of the remaining working Irish setter lines to red and white field champion English setters. The inclusion of fresh field-line blood has invigorated and resurrected the hunting prowess of the beautiful dog – albeit with much controversy. Show-bred dogs range between 60 and 70 pounds and stand approximately 27 inches tall, while field-bred red setters tend to be smaller – around 50 pounds, and with a coat featuring less feathering. With an affectionate, happy and stable temperament, the Irish setter makes a great pet for an active family – its hunting background and physical build make consistent exercise necessary. Their long, luxurious coat need careful attention; brushing, detangling and occasional trimming when needed. In addition to their role as pets, show and field dogs, Irish setters, with their affectionate personality, are also used as therapy dogs in schools and hospitals. Irish setters have an average lifespan of 11 to 14 years, and suffer from several diseases and health complications that can reduce their quality of life. Some of those things include gastric torsion, which tends to effect deep-chested dogs, epilepsy, hip dysplasia and cancers, as well as eye, thyroid and blood disorders. At Paw Print Genetics, we offer an Irish setter panel test that screens for six known mutations in the breed. Those include the neurologic disorder degenerative myelopathy; a cell issue called globoid cell leukodystrophy (Group A), which effects muscle movement and coordination; an the inherited immunodeficiency disorder known as leukocyte adhesion deficiency, type I; the metabolic issue known as neuronal ceroid lipofuscinosis 8; the eye condition of progressive retinal atrophy (Group B); and dilute (D-locus) coat color testing. In celebration of the Irish setter, Paw Print Genetics is offering 15-percent off the cost of the six-disease panel test through Nov. 17, 2013. Simply enter the code “FBIST” at checkout to receive your discount!